The New Seville 2 speed scooter is designed for users who use their scooters both on and off main roads. At the flick of a switch the speed of the scooter changes from a maximum of 4mph when used in the off road mode to a maximum speed of 8mph when used on roads used by other vehicles. To conform to Class 3 requirements the Seville is fitted with a full light set which includes headlights, tail lights, indicators, hazard flashers and a horn. 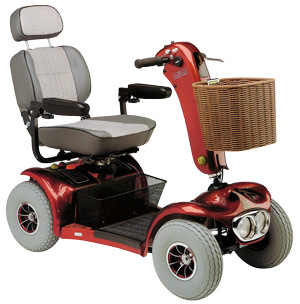 Large 13" pneumatic tyred wheels give a a very comfortable ride and the 2 shopping baskets supplied with the Seville enables shopping to be carried with ease. Having a fully adjustable Captain seat adds to the Seville's comfort and ride quality. This rotating seat enables users to mount and dismount the scooter with ease. When used with a weather canopy the Seville really is a scooter for all seasons.